LONDON, England (CNN) -- British Prime Minister Gordon Brown has defended the UK's involvement in the war in Afghanistan following the British Army's bloodiest day of the near eight-year conflict. 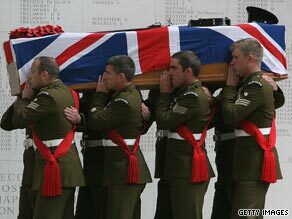 Soldiers from the Welsh Guards carry the coffin of Maj Sean Birchall, killed on patrol in Afghanistan in June. Addressing lawmakers on Monday, Brown said the security of Afghanistan was crucial to preventing terrorist attacks elsewhere in the world. "In 2009 the case for our continued involvement is the same: to prevent terrorist attacks in Britain and across the world by dealing with the terrorist threat at its source -- that crucible of terror on the border and mountain areas of Afghanistan and Pakistan," Brown told the House of Commons. "I am confident that we are right to be in Afghanistan, that we have the strongest plan and the resources to do the job." "It's a sad fact that helicopters would not have saved the lives of the individuals last week," he said, citing Lt. Col. Nick Richardson, a British military spokesman in Afghanistan. "British armed forces are better equipped today than at any time... in the past 40 years. In the last two years we have increased helicopter numbers by 60 percent and... capacity by 84 percent." But opposition leader David Cameron argued that helicopter capacity in Afghanistan has not risen as fast as troop levels. "Isn't the real point this, that the number of troops has doubled since 2006, so proportionally there hasn't really been in increase in helicopter capacity at all?" the leader of the Conservative Party demanded. The former chief of the defense staff, Charles Guthrie, "has said more helicopters would save lives," Cameron said. "If we cannot move our forces by air, they are more vulnerable on the ground," Conservative defense spokesman Liam Fox said Monday, asking if the Labour government had made a mistake by cutting the helicopter budget in 2004. Defense Secretary Bob Ainsworth dismissed the criticism. British forces are "taking on the Taliban in one of their heartland areas," he told lawmakers. "That kind of "hand-to-hand fighting... cannot be conducted from inside a highly armored vehicle and it cannot be conducted from a helicopter." Ainsworth said more helicopters were on the way, but that many operations "cannot be conducted from helicopters." On Monday the Stop the War Coalition, which has campaigned against British involvement in Afghanistan and Iraq, urged Brown to withdraw all British troops from Afghanistan, calling the conflict "an unwinnable and unjustified war." "We urge the British government to end now this futile war which, if continued, will only mean more wasted lives of British soldiers, countless deaths of Afghan civilians and further devastation of a country that has suffered from decades of war and occupation," the group said in a statement.